Eastern junior Garrett Barringer (30) is double-teamed by Wahama defenders Adam Groves and Jacob Lloyd during the second half of Tuesday night’s boys basketball contest at Gary Clark Court in Mason, W.Va.
MASON, W.Va. — For better or for worse, sometimes those are just the breaks. 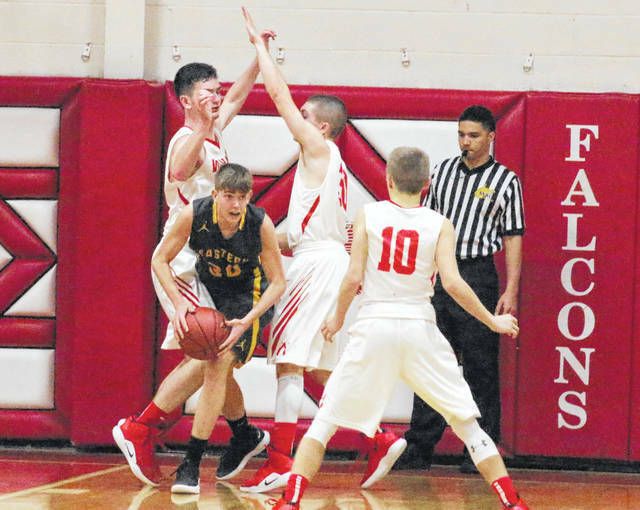 Visiting Eastern missed an uncontested layup in the final seconds of regulation, and the Wahama boys basketball team ultimately snapped a six-game losing skid on Tuesday night with a thrilling 50-48 decision in a Tri-Valley Conference Hocking Division contest at Gary Clark Court in Mason County. The White Falcons (2-10, 2-6 TVC Hocking) notched their first home victory of the 2018-19 campaign in rather dramatic fashion, as the Red and White had to rally back from a four-point deficit headed into the final canto. 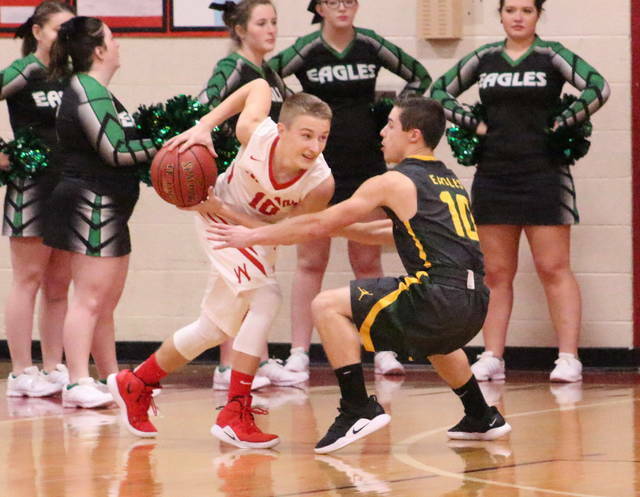 Down 39-35, the hosts battled through five lead changes and eventually secured a permanent lead with 33 seconds remaining as Jacob Lloyd buried a 3-pointer from the top of the key for a 50-48 edge. The Eagles (7-4, 5-3) ended up with possession and an inbounds pass to make from in front of their own bench with 7.7 seconds remaining, and the play was executed to near perfection. The pass went inside to an EHS player, who had an open look at the goal from the right side of the lane. The ball, however, caromed off the glass a bit too hard and rolled around the left side of the hoop before coming off in front. A Wahama player managed to poke the ball into the air and away from the crowd, and the horn ultimately sounded during the scramble for possession — allowing the White Falcons to wrap up the two-point triumph. The White Falcons held the lead in the first half for 10:39 and never trailed by more than a single possession before the break. The hosts also led by as many as five points twice in the first quarter and secured the largest lead of the night with a 29-23 advantage at the break. The Green and Gold — who never led in the opening frame and trailed 14-13 after eight minutes of play — tied the contest at 33-all, then closed the third period with a 6-2 surge that provided the guests with their largest lead of the night at 39-35. Lloyd hit back-to-back trifectas to start the fourth for a 41-39 edge at the 6:18 mark, but the Eagles answered with a 7-2 spurt that Garrett Barringer capped with a basket at the 3:50 mark for a 46-43 lead. 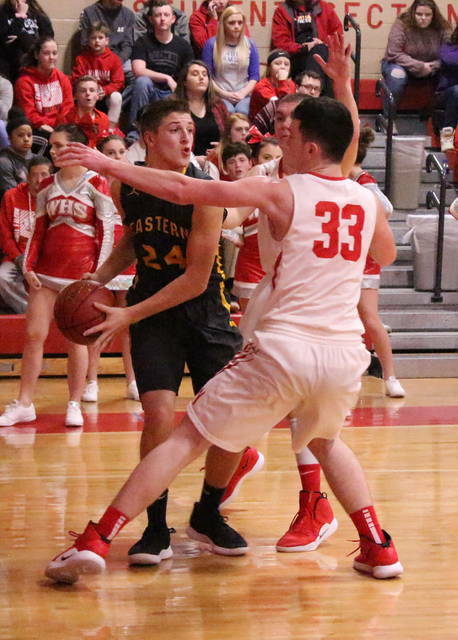 Wahama countered with consecutive baskets from Jacob Warth over the next 90 seconds to reclaim a 47-46 edge, but a Ryan Dill basket at the 1:48 mark gave Eastern its final lead at 48-47. More than a minute went by before either team scored again, and Lloyd’s eventual game-winner from behind the arc came off of a Warth offensive rebound and kick-out. The White Falcons ended up claiming a 29-21 advantage on the boards, including a 9-7 edge on the offensive glass. Eastern committed only seven of the 24 turnovers in the contest. Both teams shot over 40 percent from the field, but Wahama’s outside touch proved to be a bit more significant by night’s end. The Red and White nailed 7-of-13 trifectas for 53 percent, while Eastern made only 2-of-9 attempts from behind the arc for 22 percent. WHS coach Ron Bradley noted that his team was due for a break, but he was also more passionate about the fact that his troops put together a complete effort — which ultimately led to this final outcome. Things weren’t as easy for EHS coach David Kight to digest afterwards, but it wasn’t as much about the ending as was the beginning. And as he noted, it just kind of extended from there. “We thought we could press them early in the game, and we ended up giving up some easy points there. That one is on me and I’ll take responsibility for that,” Kight said. “Wahama’s zone gave us some fits outside and we were never able to sustain a run or get any kind of momentum. We used so much energy just getting out of the six-point halftime deficit that we really didn’t have much left from there. Wahama netted 18-of-41 field goal attempts for 44 percent and also went 7-of-10 at the free throw line for 70 percent. Lloyd hit six trifectas — three in each half — and paced the hosts with a game-high 24 points, followed by Abram Pauley with nine markers. Warth and Adam Groves were next with seven points apiece, Jonathan Frye completed the winning tally with three points. Groves and Pauley led the White Falcons with seven rebounds apiece, with Warth also hauling in six caroms. The Eagles made 20-of-49 shot attempts for 41 percent and also went 6-of-12 at the charity stripe for 50 percent. 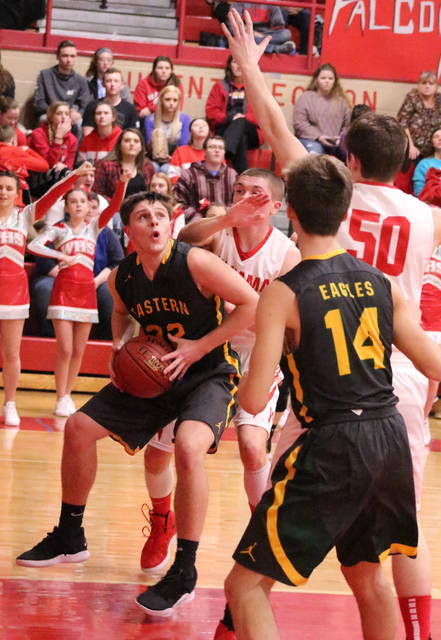 Colton Reynolds led Eastern with 10 points, followed by Dill, Barringer and Sharp Facemyer with nine markers apiece. Blaise Facemyer was next with five points and Isaiah Fish chipped in four points, while Mason Dishong completed the scoring with two markers. Barringer hauled in a team-high six rebounds. Dishong and Blaise Facemyer also had four boards apiece in the setback. Wahama returns to action Friday night when it travels to South Gallia for a TVC Hocking contest at 6 p.m. The Eagles return to the hardwood Friday night when they travel to Federal Hocking for a TVC Hocking contest at 6 p.m.